Learning how to communicate with your dog will not only improve the connection and bond you have with your furry friend, but it will facilitate the training process and make life easier for you and your dog. Using hand signals is effective because it improves comprehension by giving your dog an auditory and visual cue. Research was carried out at Nihon University in Japan by Megumi Fukuzawa and Marina Watanabe. The research revealed that visual cues are highly effective when it comes to communicating with dogs. For deaf dogs, hand signals are extremely important because they are essentially the single most effective way to give your dog instructions. In this article, we are going to list the top eight essential hand signals to teach your dog. Before you start practicing hand signals to teach your dog, there are some things that you should consider. If your dog is deaf then this guideline is recommended but not essential. However, if your dog can hear perfectly well, verbal commands are crucial. When you practice the hand signal for sit, you would say “sit” or “down” simultaneously. Do not overcomplicate the verbal commands, keep them short. One or two words is appropriate. For example, “Crate up” is an easier way of verbalising the command go the crate. Think of one or two words that will convey the message without making it difficult for your dog to grasp. Use rewards as an incentive for your dog to put in more effort during training sessions. Every time he performs well, give him a treat. This will trigger the work-reward response in his brain and he will work harder to achieve more during training sessions. At some point you will need to start gradually reducing verbal cues. Reduce the verbal cues by using them sparingly throughout your training sessions. You will also need to reduce the rewards at some point too, do this by reducing the amount of times you give your dog a reward when they get it right. With this hand signal you need to push your hand to the floor with your palm facing down. At the same time use a verbal command to explain to the dog that you want them to “sit.” If your dog is hard of hearing, you can still use the verbal command, although it is not essential. The finger point is a simple yet effective hand gesture to use when using commands like “kennel” or “mat”. It is a great signal to use when your dog is undertaking agility training too. However, it is vital that your dog gets accustomed to the signal before introducing it to their agility training routine. The thumbs up signal is an excellent way of telling your dog that he performed well. This hand gesture coupled with a treat in the beginning will motivate your dog to keep trying. Once you wean your dog off the treats, you can use the thumbs up gesture to signify that he did a good job. It is perfect for deaf dogs too. Finger point down usually signifies “lie down”. Use this gesture in conjunction with the lie down verbal command. The palm out hand signal is best coupled with verbal commands like “stop” or “off.” This signal should only be paired with a single command. Place your palm out in front of you (facing forward) and extend your arm out. Do not use this gesture with multiple commands, pick one and stick with it. This signal is widely used for deaf dogs however, it can also be used for dogs who can hear too. A bonus is that it is obviously different from other hand signals for dogs. This signal is used to tell your dog to look at you, to focus on your face. Training your dog with hand gestures has many benefits, for deaf dogs hand signals are an essential part of dog training. However, for hearing dogs it is also important to incorporate hang signals into their training regime just in case they eventually go deaf in later life. How To Train Dogs That Were Born Deaf? One of the most important traits that you will need when you are training a deaf dog is patience. Hiring an expert to help you train your deaf dog is a good idea if you feel you do not have the patience to carry out the task alone. ● Think about the things you say daily and learn as much relevant sign language as possible. Once you have mastered basic sign language, you can communicate with your deaf dog easily. You can also teach your children how to communicate with the dog by learning sign language as a family. 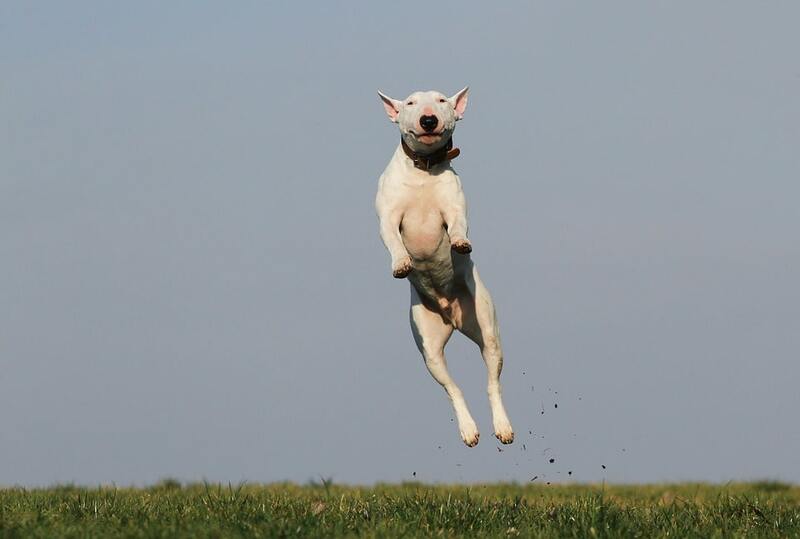 According to the Deaf Dog Education Action Fund, the best way of getting your dogs attention is thump the ground with your hand. You can also touch your dog in particular place each time to get their attention. Treats and rewards are important for hearing dogs in the beginning however, they are crucial to the success of any training program for your deaf dog. When your dog performs well, give them a treat and use the thumbs up gesture. When you begin to wean them off the rewards, reduce the amount of treats you give and increase the frequency of the thumbs up gesture. Clapping your hands is another excellent way of praising your dog. As stated earlier, if you are new to training deaf dogs, hire a professional to facilitate the process. However, if hiring a professional trainer is not within your budget, you can make use of the multitude of dog training books out there on the market. The call me signal is great for when you want to communicate the command “watch me.” Holding your thumb and your pinky finger to your face like you would do if you wanted to tell someone to call you. This is a fun and easily recognisable hand signal to use when training your deaf dog. The ok sign is a popular hand gesture that can be used to signify a positive response such as “yes” or “good.” Remember to use happy and cheerful facial expressions when using this hand signal.